The old saying, “Death by a Thousand Cuts,” is defined in Wikipedia as a form of torture and execution once practiced in Imperial China, as well as “Creeping normality” – the way a major negative change, which happens slowly in many unnoticed increments, is not perceived as objectionable. Quite often, small, seemingly insignificant overlooked details reveal themselves during a user flow or process (in this case, product registration) to the point that when viewed in summation, the overall experience feels anything but delightful and ultimately negative. I get irritated because this kind of stuff isn’t rocket surgery. It’s not even rocket science. 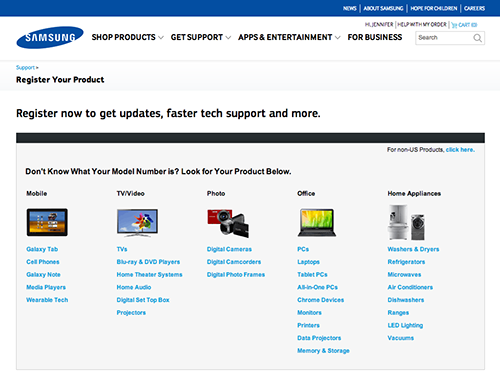 Registering a product with the manufacturer or service provider online should be easy. We know all the information, it’s generally right in front of us, and all we need to provide is our address for crying out loud. No longer are we required to cut the bar code out of the packaging and mail it in, or fill out a product registration postcard that comes with instructions and warranty. 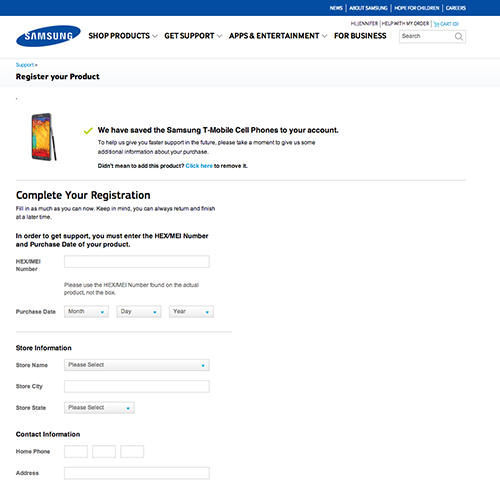 Recently during a product registration comparative analysis, I felt like I was tortured trying to register my Samsung Galaxy Note 3. Right out of the gate, small things started adding up. To begin with, I had to find where to register my product. Luckily I’d been auditing other websites and it seems that most companies tuck the action in the Support section of their websites. 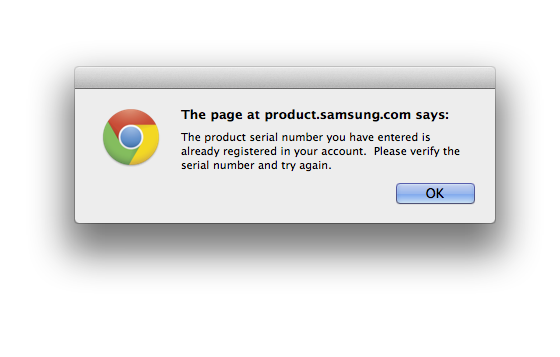 At the Samsung Register Your Product page, since I didn’t know what my model number was, I started scanning the list of links under the Mobile column. Immediately I had to determine whether or not I was supposed to select “Cell Phones” or “Galaxy Note.” It’s a Galaxy Note 3, so isn’t it a cell phone and a Galaxy Note? 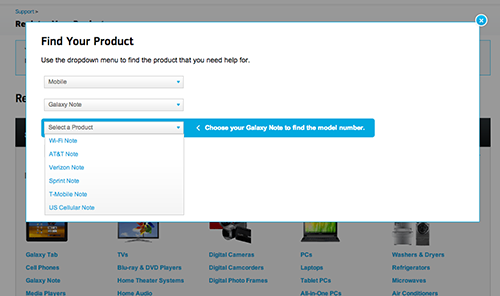 I tempt fate and click on the link labeled, “Galaxy Note.” In a overlay with a series of pull down menus, my next step is to “Select a Product” from a list of cell phone provider “Notes.” The helpful prompt reads, “Choose Your Galaxy Note to find the model number.” Wah? My product is a Galaxy Note 3 (not in the list) and my carrier is T-Mobile. What is a T-Mobile Note? After selecting “T-Mobile Note” (living dangerously, I know), one last drop down menu to go, until the next flaming hoop. 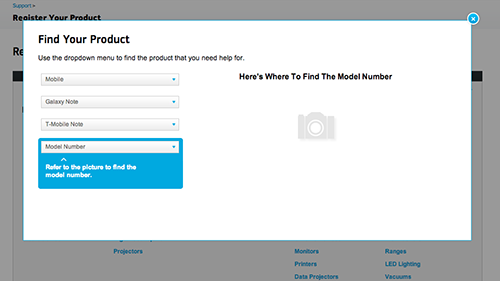 Fortunately for me the final drop down menu labeled “Model Number” displays yet another helpful prompt, “Refer to the picture to find the model number.” The picture, I guess, displayed to the right of the drop down menu under the heading, “Here’s Where To Find The Model Number.” One small problem. What’s missing from this picture? Nope. Not gonna try. I flip the device over and examine the back, thinking perhaps there’s something similar to my iPhone. Nothing on the back. Just the black, fake-leather back with T-Mobile/Galaxy Note 3 emblazoned on it. I remove the black, fake-leather back. Now I’m looking at the battery. Still nothing. Off to Google I go. I start by searching for how to find my model number for my Galaxy Note 3. Fortunately for me, someone put a tutorial on YouTube. I remove the black, fake-leather back. I pull the battery out. There it is. 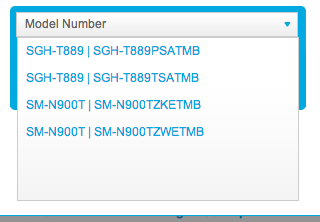 Oh but wait, it only shows the first 6 characters, “SM-900T.” Where’s the other number in either ZWETMB or ZKETMB? I got nothing. Once again, I decide to guess. This time, however, I assume that the “W” stands for “White.” Since my Galaxy Note 3 is black, I select the “ZKETMB” option. Fingers crossed. Success! According to the rather small product photo, I guessed correctly. The confirmation language however, is anything but close to what I registered. “We have saved the Samsung (correct) T-Mobile (also correct) Cell Phones (I registered a Galaxy Note 3, and only one of them, as in, not plural) to your account.” Oh well, close enough. Now all I have to do is add some additional information and I’m done. The instructions tell me, “Fill in as much as you can now. Keep in mind, you can always return and finish at a later time.” Sounds optional to me. And, also per the instructions, “Please use the HEX/MEI Number found on the actual product, not the box.” Okay, fine. But it makes me think, why wouldn’t they be identical? What makes the HEX/MEI on the box (actually labeled “Handset IMEI”) not usable? Naturally, I had to check the box against the device. Just as I suspected. They’re identical. Okay, to be fair, I had information in the zip code field. But the instructions said to fill in as much as I could now. Doesn’t that infer partial completion? And how come the “State” pull down menu isn’t outlined in red with instructions to select a state like the other blank form fields? Fine. Whatever. I fill in the rest of the contact information to make the website happy. And click the “Submit” button at the bottom of the form. I just want this to be over. SERIOUSLY!? A blank screen with a Chrome dialog box? Is this an alert? A Warning? The product is already registered to my account!? How is this possible? Hello? I’m trying to complete my registration. 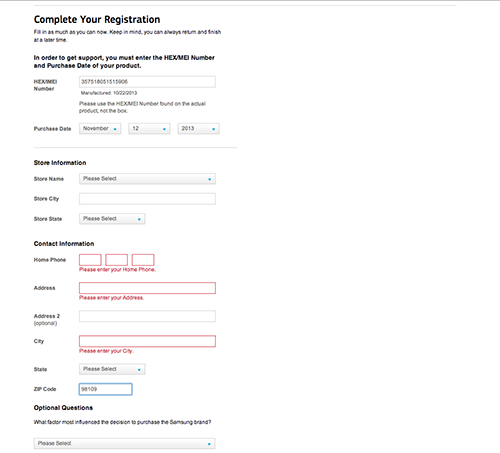 I click on the “OK” button, expecting to be automatically returned to my partially complete product registration page. 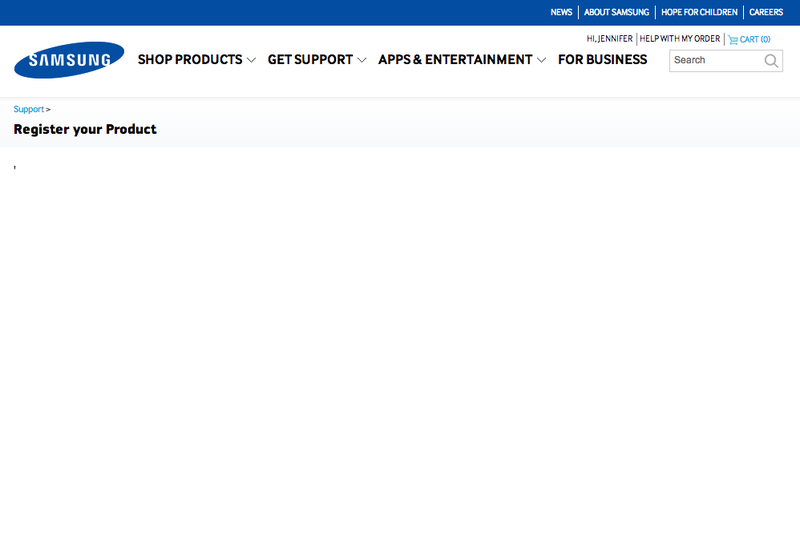 Instead, I get a blank, “Register your Product” page. I think at this point the average consumer would have tried to contact Samsung, or call their 13-year old nephew to figure this out. However, being a UX person, I feel my sense of obligation to keep pushing through. I hit refresh a couple of times until I get back to the product registration page I was on originally. Instead of removing the product and starting me back at step 1, the site just keeps refreshing the partially complete product registration page. Only it’s removed the date of purchase. Obviously, I’m tempted to see how this is affecting “My Account”. Do I have zero products? Or more than one Samsung Galaxy Note 3? I get a blank page for my answer. After a good 6 minutes of troubleshooting, I get into My Account. I have one Samsung Galaxy Note 3, (carrier: T-Mobile) registered. It took me nearly 25 minutes. 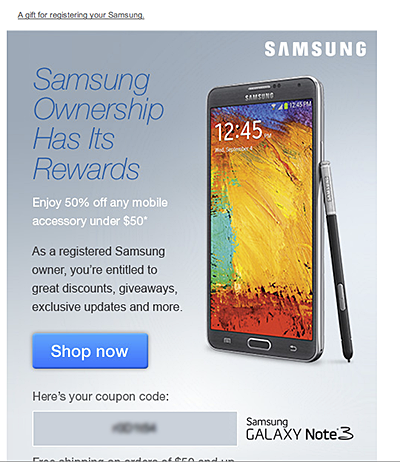 I get an email congratulating me on my successful registration (“A gift for registering your Samsung”). Apparently, ownership has it’s rewards. My reward is 50% off any mobile accessory under $50. Awesome, I’ll buy a case for this puppy. I click on the big, juicy “Shop now” button and am presented with a page of accessories for under $50. Yet none of the accessories shown are for a Galaxy Note 3. At first I’m confused. Why are they showing me accessories for a product I don’t own? And then it hits me. All of these products are under $50. 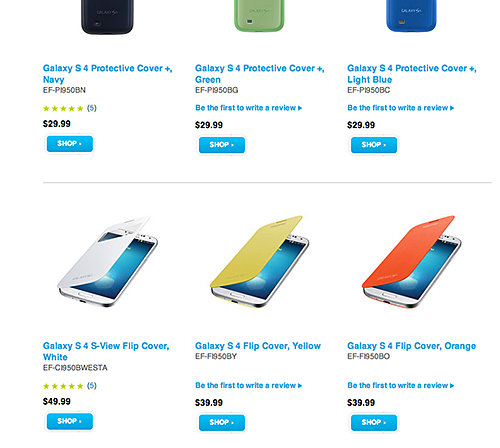 But cases for the Samsung Galaxy Note 3 start at $59.99. Not only are they linking me to accessories I can’t use because they’re for the wrong product, the product I actually want doesn’t appear to qualify for the 50% coupon code. Damage in the sense of loss of trust and consumer confidence. Damage as in negative feelings towards the brand. Damage as in the erosion of the user perception that the brand cares about its customers and their ongoing product experience. Painful! I’m still “healing” from the wounds from our comp/comp analysis for SMC. There are reasons Samsung ended up at the bottom and you’ve done an excellent job of documenting them. Ouch.